When I ask about my patients’ eating habits, many parents tell me that their child “hates vegetables” or “only likes carrots dipped in ranch dressing” or “loves French fries, but nothing else”. Moms hate going to the effort of preparing a lot of vegetable dishes when nobody at home will eat them. Sound familiar? Vegetables are powerhouses of vitamins and minerals for healthy growth and healthy hormone function. They are important to get your kids’ brains working better so they can learn better in school. The same is true for adults: better function at work, better decision-making. 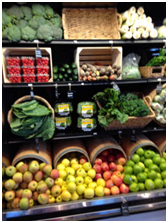 Even the US Department of Agriculture recommends 5-8 servings of fruit and vegetables – every day! Not 5-8 servings every week! Including more vegetables and plant –based foods like lentils and legumes can stretch your food budget, because a pound of vegetables are almost always cheaper than a pound of meat or fish or chicken. How can you get your family to eat more vegetables? Kids are wonderful observers. Little kids will mimic what their parents do, and will try something just because a parent is eating it. 2. Get the kids involved in meal prep. Little ones can tear lettuce and toss a salad (you can always add the dressing after they toss it!). Older ones can learn lots of basic cooking skills, like peeling and handling a knife properly. Kids love to operate the Spiralizer spiral slicer for zucchini. 3. Take the kids shopping with you. The grocery store can be a great place to put math to work, using prices and quantities and volumes. 4. Have a family policy on tasting. Some families have a rule that everybody, including the parents, must try at least one bite of something new. I also think that everyone should be allowed to express an opinion, but nobody should make a big fuss over something they don’t like. Children often adopt the attitudes of those around them, good and bad! 5. Try something new every week. Pick out a new vegetable or fruit at the store, have the kids learn where it comes from or find a recipe on how to fix and use it. 6. Make a game out of eating vegetables. Have a contest: the winner is the one who eats the most different vegetables in a week, or who eats the most different colors (red peppers, green lettuce, yellow squash, etc) in a day. 7. Serve a tray of veggies and hummus dip in the hour before dinner when kids are starting to get cranky. 8. Keep veggies cut up and ready to go in the refrigerator, stored at kid level for easy access. You can get the family involved in peeling and cutting. 9. If your kid really refuses veggies, consider the possibility of zinc deficiency. Low zinc levels impair the sense of taste and can make a kid very picky about foods, usually preferring junk foods over healthy ones. Food texture issues can also indicate a low zinc level. I recommend a red blood cell zinc level that any doctor can order. Serum zinc levels are not as helpful, and I don’t use them as reliable indicators of zinc status. 10. Junk foods are very tempting and tasty. Get them out of the house! Most of us, kids and adults alike, have a hard time avoiding those sweet, salty, fatty foods if they are around. Run cauliflower through your food processor to get rice-sized pieces, and use it like rice. Add veggies in soups and stews. Hiding can be helpful, but I also think it is a good idea to include vegetables people can see and try. Research shows that it often takes 10-15 tasting tries before a child will accept a new food. Keep putting the same things out, in addition to trying something new. If you try all of these tricks and you are still not getting anywhere, consider a feeding therapist. These professionals know all the tricks to help your child start eating a broader variety of foods and textures.